Dr. Nick on the Simpsons is named after the doctor that prescribed narcotics to Elvis Presley, George Constantine Nichopoulos. Dr. Nichopoulos initially began treating Elvis in 1967 for “saddle pain” and later was hired as his personal physician until Elvis’ death in 1977. 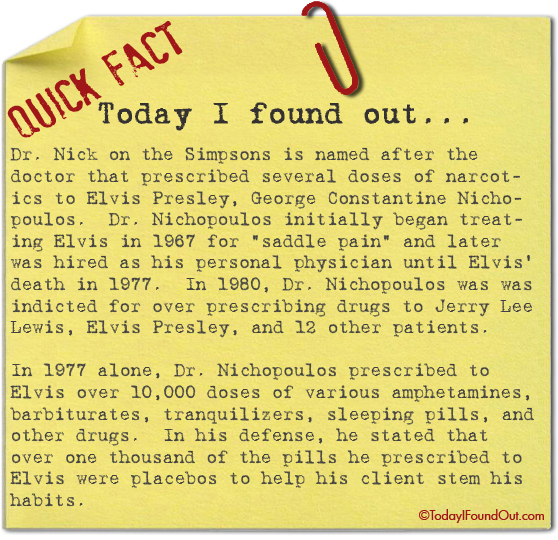 In 1980, Dr. Nichopoulos was was indicted for over prescribing drugs to Jerry Lee Lewis, Elvis Presley, and 12 other patients. In 1977 alone, Dr. Nichopoulos prescribed to Elvis over 10,000 doses of various amphetamines, barbiturates, tranquilizers, sleeping pills, and other drugs. In his defense, he stated that over one thousand of the pills he prescribed to Elvis were placebos to help his client stem his habits.